Today's Inspiration: Tom Sawyer: "I drew from the time I could hold a pencil." 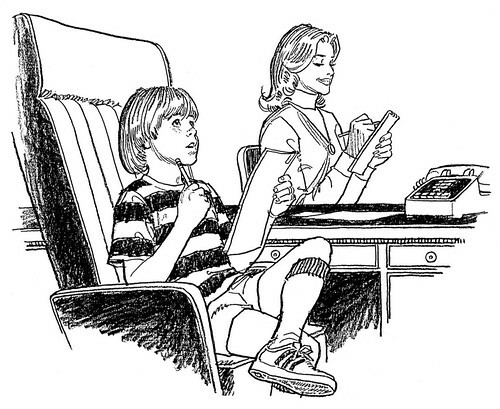 Tom Sawyer: "I drew from the time I could hold a pencil." "I drew from the time I could hold a pencil. And being an only child, I had a lot of solo-time, during which I drew constantly." Those are the words of Tom Sawyer (then 'Scheuer'), who decided when he was 12 years old that he would one day see his name and his work on the comics page of the nation's newspapers, just like that of his hero, Milton Caniff. That's Sawyer below shaking hands with Caniff. "I was 14," says the artist, "and thrilled out of my mind to meet him -- as you can imagine." "Part of my reason for being addicted to Caniff and Terry and the Pirates was the combination of his drawing and writing. It was like reading a terrific novel, or watching a great movie -- in daily snippets." Some of his earliest inspirations, Tom recalls, included "L'il Abner, Napoleon (about a dog, as I recall), Mutt & Jeff, Don Winslow, etc., but when I got hooked on Caniff, all the others paled for me. And yes, I drew strips, but before that, once I learned to read & write (age 7-8ish, I suppose), I wrote dialogue balloons for many of my individual figure drawings." By age 11 Sawyer was already a paid commercial artist, producing gag panel cartoons for a local baker's trade publication at $5 each. "I vaguely recall that it was through a friend of my dad," says the artist today. "The money, as I remember, was no big deal -- I also began doing window posters for local shops. And yes, it was cool seeing the stuff in print. Educational, too. That part continued in H.S., in terms of seeing how various line treatments reproduced, how much was lost in size-reduction, etc. I remember being fascinated by plate-making, etc., and visiting the Chicago Tribune engraving department (they did the work for our weekly newspaper) to view the process." 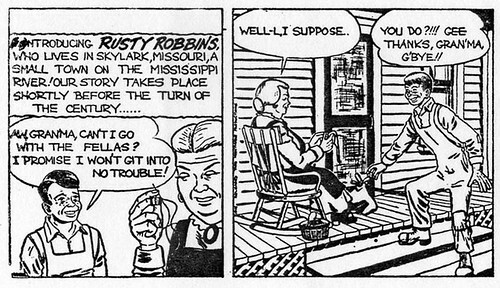 Tom produced a weekly comic strip, "Rusty Robbins" (above) during high school for The Hyde Park High School Weekly. Asked if having a weekly strip in school newspaper gave him a sense that he was on his way to achieving his long-range goal... and if it earned him some fame and respect among his peers, Sawyer responds, "Yes, to both questions. The latter gave me a kind of subversive satisfaction in that it was quite counter to my father's repeated admonition that I shouldn't try to draw attention to myself." "It was a cartooning class, taught by a really sweet guy, Martin Garrity, who did gag cartoons for The Saturday Evening Post. There were several other kids my age (all of whom had already decided to be cartoonists), and it took place on Saturday mornings. Among my fellow students was Hal Higdon, and we're still friends. Hal became a writer ( www.HalHigdon.com ). Garrity pretty much let us pursue whatever forms and techniques that interested us, instructing and coaching us in drawing and rendering. He was a believer in the notion that in order to draw effective cartoon (humorous) figures, we first needed to know how to draw the human figure at least fairly realistically. Marty was wonderful, always encouraging. And during those sessions, I'd occasionally sneak into the life class next door. BTW, I later learned that Bill Mauldin was a full-time student at the Chicago Academy of Fine Arts. "I started getting thrown out of school (at least once per year) in 4th grade. This extended all through high school. Though I didn't understand until years later, I hated all of it because I was bored out of my mind, never challenged (until 5th grade I received the equivalent of straight A+ in everything). From then on, I was, gradewise, a terrible student, all-but-a-dropout academically." "I finally, and abruptly, became a different person, at about age 15. All else, in my view, has stemmed from that, from the bulletproof ego to the unwavering belief that I am entitled to enjoy my work and my life." "I suspect that a lot of us become more creative (do more with what we naturally have) as a result of unhappy childhoods. The educational system is designed to beat our natural creative gifts to death as quickly as possible, in order to turn us into willing (if not necessarily happy) employees. The "fight" in us, which is stimulated by conflict with parents or siblings, is what makes most of us turn out to be mavericks (creative types), working essentially outside of the system." 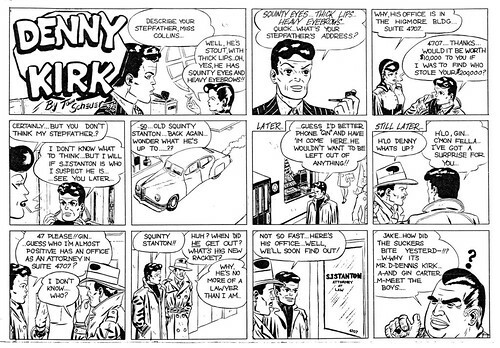 strive to emulate Milton Caniff. Just the other day I had a letter from a gifted young artist who told me his favorite artist was Caniff and how he loved to find old TERRY & THE PIRATES strips. Sawyer's story just echoes all of that. Thing is, it is still going on today. Now that's a legacy to envy. You're so right, Ron - Caniff's influence can't be understated. 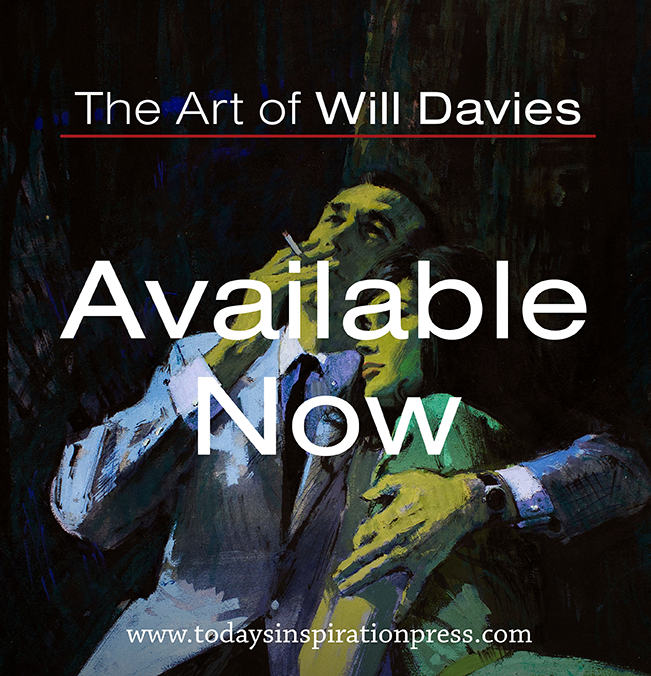 His work transcends generation gaps and stylistic trends. 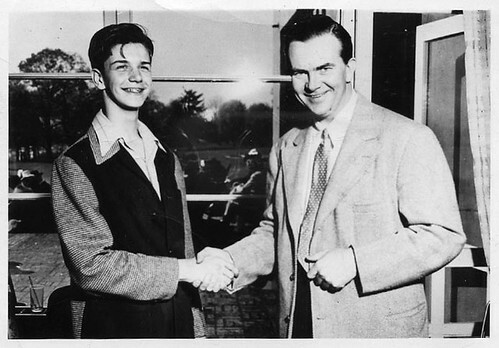 You may recall, in in our first post on Barbara Bradley's career, Barbara credited Caniff with playing an important role in her childhood interest in becoming an illustrator.